With the nomination of Neil Gorsuch to the Supreme Court, President Donald Trump accomplished his goal of replacing Justice Antonin Scalia with someone “very much in the mold” of the conservative champion, analysts say. Trump on Jan. 31 chose Judge Gorsuch, of the U.S. Court of Appeals for the 10th Circuit, from a list of 21 individuals. Gorsuch “is an eminently qualified and well-respected judge with a record that demonstrates he cares about religious liberty, the separation of powers, and the original public meaning of the Constitution and the laws he interprets,” The Daily Signal said in an analysis. Hobby Lobby v. Sebelius: He distrusts efforts to remove religious expression from public spaces generally, but watch out for cases citing RFRA and RLUIPA — he ruled in Hobby Lobby v. Sebelius that the contraception mandate in Obamacare placed an undue burden on the company’s religious exercise and violated RFRA. Roe v. Wade: Gorsuch has never had the opportunity to write on Roe v. Wade. But, for any indication on how he would vote on abortions, the “right to privacy” defense from the dormant commerce clause is relevant, and he isn’t buying it. This clause, known as “dormant” since it is not explicitly written out in the Constitution, indicates that since Congress regulates interstate commerce, states cannot pass legislation that unduly burdens or discriminates against other states and interstate commerce. Capital punishment: Gorsuch is not friendly to requests for relief from death sentences through federal habeas corpus. Criminal law: Gorsuch believes there is an overwhelming amount of legislation about criminal law, and believes that cases can be interpreted in favor of defendants even if it hurts the government. On mens rea — which means “guilty mind,” or essentially the intent to commit a crime — Gorsuch is willing to read narrowly even if it means it doesn’t favor the prosecution. 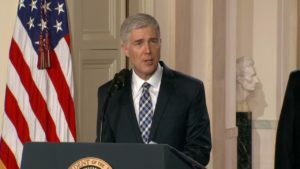 Checks and balances: Gorsuch does not like deferring to federal agencies when they interpret laws, so watch out for use of the Chevron rule, which allows federal agents to enforce laws in any way that is not expressly prohibited. Gorsuch may push back.